Phoenix Polar Lander is on a fantastic vacation. 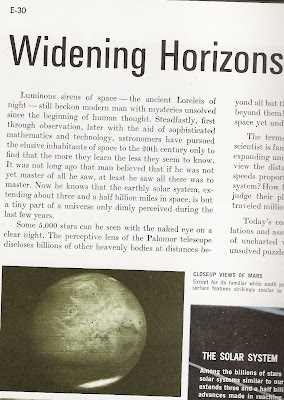 Wow, pictures from the landing site are far sharper than this image of Mars that I found in an old textbook. Soon it will be time to look for some ice for the picnic cooler. Congratulations on a successful landing. No, they don't really have a picnic cooler full of beer and sandwiches on this unmanned mission. Still, they are hoping to find ice just under the surface. Ice that they can scoop up and analyze to learn a lot about the chemical composition of soil and ice on Mars. Could life have ever existed on the red planet? That's one of many questions worth pondering. Our frontiers of knowledge keep expanding. The more we learn, the less we feel that we are at the center of the universe. It's good for humankind to have lessons in humility at times. Enlarge my image to find some poetic writing about exploration from that old textbook. Maybe not that old, 1971.